There is much conversation about invasives. Below are lists of Minnesota and Wisconsin invasive plants. Don’t allow invasive plants to flourish in your yard. Never purchase them or bring them into your yard, and please refrain from using chemicals on them. Pull them out and keep them from seeding. When you throw a plastic bottle in the trash, what do you think happens to it? These bottles do not dissolve and will be on our planet forever!! The garbage patch in the Pacific Ocean is broken pieces of plastic that harms sea life, and probably poisons us. According to the MPCA, Minnesota recycles only 25% of its plastic bottles. Why individuals still throw recyclables in the trash is beyond comprehension, especially when most of us just need to haul recyclables out to our curb a few times a month. As responsible citizens of our earth we must do better, and communities need to install recycle containers beside the trash containers like Duluth has done! An incentive: By recycling your bottles and cans you help generate needed funds for local and state governments. You help create materials that can be made into new products which stimulates manufacturing jobs. Using recyclables instead of raw materials can reduces costs for manufacturers, and then lower costs for you, a win-win situation! First, reduce your waste( reusable containers), but then recycle everything you can! Make this your first stop at the Minnesota State Fair: The ECO Building. Author health4earthPosted on August 25, 2012 Categories UncategorizedLeave a comment on Recycle ALL those bottles! Walking a trail in Duluth, I struggled to find native plants. The very invasive Tansys, thistles and Bird’s-foote Trefoil dominated. Their bright yellow colors were pleasant, but we only saw one frog and no butterflies, bees or birds which seemed unusual for a magnificent August day. And Purple Loosestrife is making a comeback growing along roadways. July 2012: Hottest Month In U.S. History. Accurate weather records go back to the late 1800s. Since then there has never been a month as hot as July, 2012. Details from NOAA: “According to NOAA scientists, the average temperature for the contiguous U.S. during July was 77.6 F, 3.3 F above the 20th century average, marking the hottest July and hottest month on record for the nation. The previous warmest July for the nation was July 1936, when the average U.S. temperature was 77.4 F. The warmest July temperatures contributed to a record-warm first 7 months of the year, and the warmest 12-month period the nation has experienced since record-keeping began in 1895. Just looking at the map I was struck with the thought that this gives new meaning to “red states”. Author health4earthPosted on August 9, 2012 Categories UncategorizedLeave a comment on Yes, we lived it! Everyday appreciating our beautiful earth, And working for healthy communities through less chemicals, less waste, And more fun! A north wind has brought a change in the weather and I hope a cooling of the earth. Fox cubs, fawns, baby chickadees, redstart and song sparrows are demanding of their moms for food. A sphinx (hawk) moth zips around entertaining me, and a lone black bear saunters through. Hummingbirds are enjoying the flowers as much as their feeder and seem to be everywhere. Goldenrod and wide leaf asters are in full bloom, and I learned the Northern Crescent Butterfly. Lake Superior is finally blue again after the heavy June rain. At 5:30 AM it is very noisy outside with lots of running. A blossoming buck is playing with my local fawns. Next the buck turns to their mother and goes into a mating dance routine with her–Spectacular! Just chased the fawns away from my cone flowers. A large owl has hunted in our yard all morning causing a ruckus of our nesting and local birds. Earlier a flicker mom was feeding her babies as we had an outside breakfast on our deck overlooking Lake Superior. 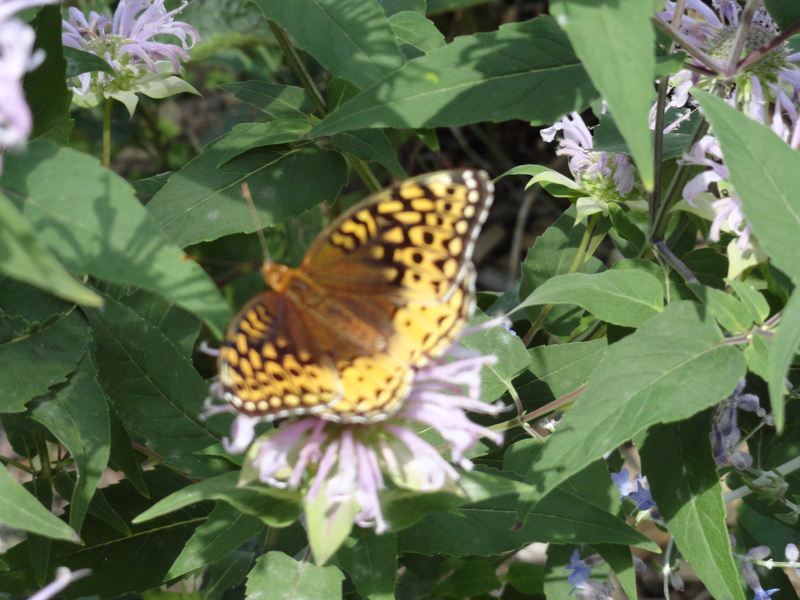 We continue to plant new native and butterfly host plants to our yard. Author health4earthPosted on June 5, 2012 August 10, 2012 Categories Uncategorized1 Comment on Everyday appreciating our beautiful earth, And working for healthy communities through less chemicals, less waste, And more fun!